Stars: Peter Cilella, Vinny Curran, Zahn McClarnon, Bill Oberst Jr.
To save him from drug addiction, a man chains his best friend inside a remote cabin for seven days that haunt both men in strange ways. Michael Danube receives a mysterious email containing a map and a video of his best friend Chris Daniels. The video contains a montage of Chris acting strangely at a remote cabin while under the influence of drugs. Michael says goodbye to his wife Jennifer and heads for the point marked on the map to save his friend. Michael tries convincing Chris to finally enter rehab, but Chris refuses. Michael shocks his friend with a stun gun and handcuffs him to a pipe inside the dilapidated cabin. Michael tells Chris that he will stay chained and without drugs for seven days. After that, Michael will leave him to do whatever he wants. Michael goes into town for groceries. In the parking lot, he walks by three Native American men. Michael calls his wife and tells her that Chris agreed to go to rehab and that he is staying with him for the week. Back at the cabin, Michael finds a dog that Chris has named Sarah, but her tag indicates that she belongs to someone else. The next day, former high school classmates of both men and Chris’ current drug dealers, Billy and Micah, come looking for drugs that Chris owes them. With a baseball bat at hand, Michael tells them to leave, but they counter with a veiled threat of their own. Looking for Chris’ drugs, Michael goes underneath the cabin and finds a box of strange black and white photographs. Chris claims that he found them by a stone house. Michael goes for a walk and meets three men from a UFO cult. He also finds a shed with a small reel of film. During the night, a woman appears at the window. Chris explains that patients from a nearby mental health clinic wander all the time. Billy and Micah return the next morning. Michael offers to write a check for what Chris owes them, but they demand the drugs instead. They leave when the Native Americans from the parking lot arrive. Charles from the trio tells Michael that they are squatting on reservation land. Michael makes a deal to pay Charles cash so that they can stay for five more days. Michael finds the ruins of the stone house. Inside the remains of an outdoor oven he finds a record. In a nearby shed he finds various recording equipment, including a record player. The recording appears to be of someone being attacked. Michael brings back a projector and watches the film reel that he discovered earlier. The film depicts a strange couple covered in blood. Michael learns that Chris did not send him the video and the map that led him to the cabin. In the morning, Michael finds a library book left on the doorstep. He goes to the casino to pay Charles, who warns Michael that he should just leave. At the library, Michael finds a collection of slides on the shelf where the book belongs. The slides show a screaming one-armed man who ends up hanged. Michael wonders who is leaving the recordings and depictions of stories with strange endings. After a night of drinking, Michael wakes to find a transparency lying on his chest. He matches it to one of the photographs that Chris found and follows the clue to a local gravestone. There, Michael finds a VHS tape. Chris and Michael watch the tape and discover that it is of them inside the cabin. Michael returns to the shed filled with recording equipment and finds a journal written in French. He asks Charles about the shed and learns that the cabin was once rented out to French students researching folktales. Back at the cabin, Michael dismisses Ted Tellensworth, a pseudo-mortgage broker engaging Chris in conversation. Michael asks Chris to watch the video email again, but on the laptop instead is a recording of what transpired on the porch just moments earlier. Billy and Micah shoot and kill Sarah. Michael hikes to a nearby cave and finds strange paintings on the wall. He then sprains his ankle when startled by a homeless hobo sleeping inside. Michael follows the address on Sarah’s tag to a trailer in order to inform the owner of her death. Michael meets Byron, a Frenchman who tells Michael that he was researching alongside the students whose recording equipment is in the shed, but they inexplicably disappeared one day. Byron found their papers about bending light and sound waves, and believes that the students “were looking for monsters.” He explains that stories are told to make sense of the infinite. Michael returns to the cabin and treats a wound on Chris’ arm. Michael wakes and finds a knife on the cabin floor underneath a freshly carved drawing that resembles an image from the cave wall. Michael tells Chris about his meeting with Byron. He also mentions that all of the stories that they have been presented with have had an ending. Chris explains that he will never go to rehab and Michael needs to just let him go. When Michael agrees, the slide projector turns on and shows images of Chris dead and Michael in a coffin. The laptop shows video of the present. It fast forwards suddenly and they watch Billy and Micah break in and beat them to death. Michael theorizes that whatever is doing this to them wants a story with an ending. Chris and Michael flee the cabin. They find Billy and Micah’s drugs stashed in a truck outside. Michael puts them in the cabin for Billy and Micah to find. Chris and Michael then get into Michael’s truck and find a CD. They play it and hear Charles and his friend entering the cabin, shooting them with a shotgun, and burning the cabin. Michael realizes that he cannot go home, but they also cannot go back to the cabin. Should “Resolution” find the wide audience that it deserves, it has the potential to end friendships, doom marriages, and lead to fistfights in the parking lot after a screening. That is a hyperbolic overstatement, but the fact remains that “Resolution” is a polarizing film. It is the type of viewing experience where those who fall in love with it will pass off critics with a harumph as people who just did not “get it.” And haters will point at the open-ended interpretation as unsatisfying and label the storytelling style as unappealing. Chris is a junkie. After receiving an emailed video of Chris’ latest bizarre antics and a map to his remote location, his best friend Michael decides that he has had enough. Michael confronts Chris at a rundown cabin in the woods and begs one last time for Chris to enter rehab. Chris refuses. So Michael does what any desperate friend would do in the situation. He subdues Chris with a stun gun and handcuffs him to a pipe. In seven days, Michael will give Chris the key to the lock and the freedom to go whichever way he chooses. Until then, Michael is going to force Chris to stay clean through imprisonment. 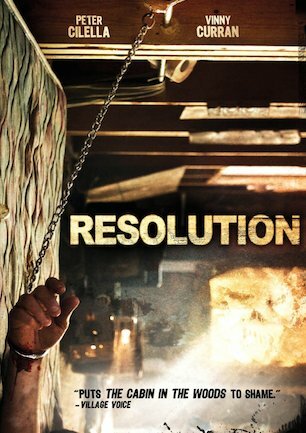 That description along with the poster art of a bloody wrist chained in a shack give the false impression that “Resolution” may be a torture horror clone. The only torture that goes on is psychological, and it is not induced by withdrawal symptoms. Nor does it come in the form of an intervention between a drug abuser and his former friend. “Resolution” is a cerebral horror film that defies explanation without introducing spoilers. Michael plans to be alongside Chris for his week of captivity. What happens next challenges both of them to question reality, as well as their own sanity. The week of cold turkey is only a jumpstart for the real story. Vinny Curran is sensational as Chris. He fits the classic junkie stereotype. Having lied, cheated, and stolen his way straight into the gutter, Chris is a dead man walking whose every friend has written him off as a lost cause. But Vinny Curran is so good at giving Chris a pitiful personality that it is easy to be onboard with Michael’s last ditch effort to save his former friend’s life. Chris’ demeanor, and his dialogue, is entertaining. He comes across not as a drug-fried d-bag, but as a likeable guy who was once the life of the party and can still be remembered for being funny as well as fun to be around. The entire film is well cast. Peter Cilella has the right tone as Michael. Although Michael is a more subdued family man, he is not so grounded that he cannot be seen as having once been a troublemaker alongside Chris in his wilder days. Michael’s yin counterbalances Chris’ yang. Bill Oberst Jr., familiar to many as “The Facebook Stalker” in the brilliant social media app “Take This Lollipop,” finds a similar balance in his brief role. He has an edge of creepy to accent a welcoming vibe that makes for a suitably unsettling presence. And unsettling is something that “Resolution” has the ability to do very well. The script is structured so that the story’s final destination is never in full view. And the path it takes there continually fascinates like an almost maddening dangling carrot. The movie unfolds in such a way that waiting for clues and answers to be revealed is not a chore. The more that the world around this cabin is explored, the more captivating the movie becomes. Salesmen, UFO cult members, Native American tribesmen, a stray dog, and angry drug dealers visit the premises. Strange photographs, records, journals, and film reels reveal tragic stories of past travelers to the area. So many seemingly unrelated elements come and go until everything adds up to a finale that ties everything together in a most unusual way. “Resolution” is so confident in what it creates onscreen that the visuals are not artificially enhanced by a soundtrack. Although the cabin is situated in a real location and is populated by real personalities, albeit eccentric, the environment is uniquely strange on its own. Each time Michael leaves Chris alone in the cabin, whether to buy groceries or to check in with his wife, there is a disturbing feeling that each of them is unsafe. Threats seem likely from any direction and there is a constant unease about what Michael will discover next or what might be waiting when he returns to the cabin. The film is shot with a dose of a documentary vibe. Shots that do not involve dialogue are rarely longer than they need to be. “In between” scenes have a tendency to pack a lot of information into the frame and then move along quickly. There are some pacing stumbles that interrupt the flow about two-thirds of the way through. The mystery stops progressing for a while as Michael and Chris return to sorting out the drug addiction during extended conversations. And there is too much of a good thing as Chris’ behavior borders on overexposed. Those without an affinity for these personalities will have a tough time sticking it out. As to whether or not the film is scary, or effective as a horror film, it comes down to personal tastes. “Resolution” is not about jump scares or gory deaths. The film intends to affect on a mental level through uncomfortable moods and feelings of anxiety. Anyone unwilling or unable to invest in this atmosphere will feel none of the above. Those prepared for a psychological thriller with a compelling mystery, on the other hand, will feel “Resolution” in a state that can certainly be defined as horror. “Resolution” will work its magic on many. To others, the narrative technique and arthouse feel just will not be appealing. But it is unpredictable, intelligent, unique, and immensely entertaining. Love it or hate it, “Resolution” is an astonishing and original independent movie that deserves to be seen and deserves to be talked about. July 16, 2013 by Ian Sedensky.